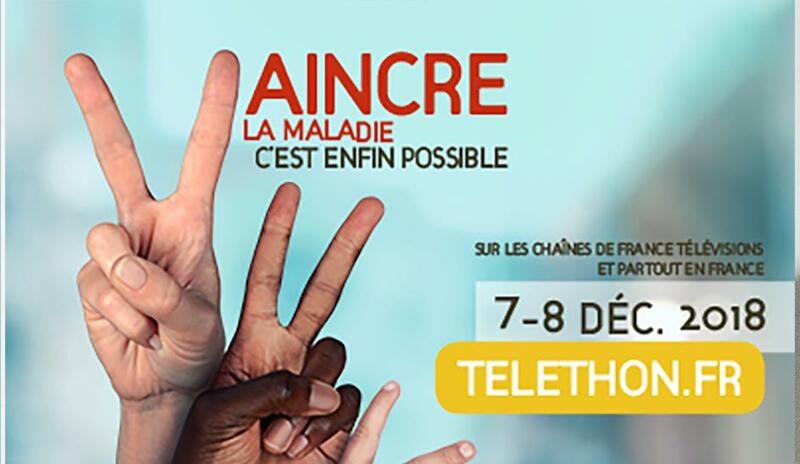 The AFM Telethon has become France’s major fund-raising event in France and takes place every year on the first week-end of December with hundreds of thousands of volunteers, participants and artists. The Telethon is also a 30-hour TV program on a public channel. This year, it will take place on the 7th and 8th December. For the first ever telethon, imported in 1986 from America, the money meter was only designed to go up to 8 figures. Technicians had to paint the 9th figure on a piece of wood! The show raised 181 327 459 francs (27,6 million euro). Take a look at the regional telethon site to find telethon events going on near you or contact your local Mairie or tourist office. Follow local events too HERE on Facebook. Behind the fun and entertainment of the AFM Telethon is a serious purpose: to raise funds to support AFM’s research programmes and services for people with neuromuscular diseases and to inform the general public about rare genetic disorders. Donations have helped research into gene-based therapies which are the best hope for curing thousands of currently incurable diseases, whether they are genetic diseases, like most neuromuscular diseases, or rare or even common diseases. Donations also go to promoting the understanding, the diagnosis and management of diseases which are often neglected by the public health system. The AFM-Telethon has helped improve the life of neuromuscular disease patients and change the way society looks at disability For those who fight every day against a devastating disease, each Telethon is a new step on the road to victory over these diseases. Your donation will help accelerate research progress and raise patients’ hopes. ☞ The word ‘Téléthon’ is a contraction of television and marathon and symbolises 30 hours of non-stop live broadcasting on France 2. ☞ The Téléthon idea comes from the USA and was launched by Jerry Lewis in 1966. ☞ Eighty per cent of all donations go directly to charity whilst the rest is used for admin, publicity, organisation, personnel costs and preparation and production. ☞ Presenters and performers in the Téléthon all offer their services free of charge. you will then receive your ‘promesse de don’ (pledge confirmation) by post and should send a cheque in the pre-paid envelope provided.